Duane Underwood finally brought his considerable talents to the big league club in 2018. 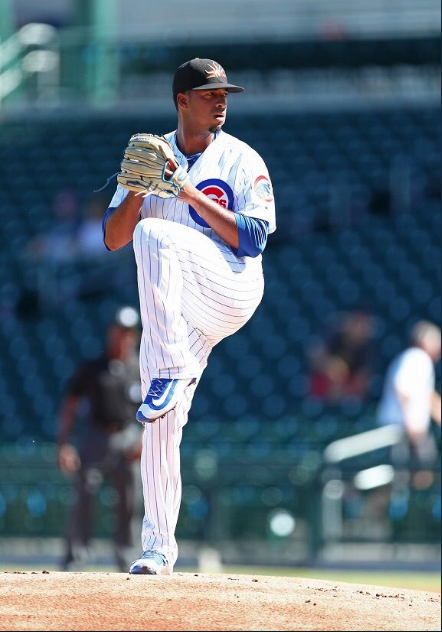 It was only one game and four innings pitched, but personally, it felt good to finally see Underwood in a Chicago Cubs jersey during the regular season. 2018 Stats: For the Iowa Cubs the right-hander posted an ERA of 4.53, a WHIP of 1.37, a DRA of 3.67, and a DRA- of 78.9. Year in Review: In 2018, Underwood was returning from yet another injury and making the jump from the Cubs Double-A squad, the Tennessee Smokies, to the Triple-A Iowa Cubs. His numbers didn’t stand out in an overly impressive fashion. But, in 2018 the numbers weren’t as important when it came to Underwood. Yes, the Cubs wanted his time in Iowa to be fruitful and for him to continue to develop as a pitcher. What the front office wanted most of all was for Underwood to remain healthy for the entire year. To avoid nagging injuries, to be able to work on his pitches, mechanics, etc. all season long. In 2018 the front office got that, and that’s why 2018 ended up being a successful season for Underwood. To be fair, the former 2nd round pick’s numbers weren’t terrible in 2018. They were decidedly middle of the road, but they improved upon his numbers with the Smokies in ways that mattered. He lowered his BB/9 from 3.3 to 2.8 while raising his K/9 from 6.4 to 7.9. He moved up a level to face better hitters in a league that is more hitter-friendly, and Underwood still managed to improve. Underwood continued to flash moments of brilliance while working on his game where it needed to be worked on and getting better. In many ways, his June 2018 start with the big league Cubbies is emblematic of how Underwood’s minor league career is progressing. There was some rockiness to start, times where it seemed like Underwood was about to lose control and then he did for a scant second. But, he reeled it back in, and when he exited after the bottom of the fourth, Underwood had put in a good performance. It’s only one game, and I’m not going to write a treatise on a prospect based on that small of a sample. But that game is Underwood to a T; it may take some time and be kind of ugly at first, but eventually, he figures it out and shows why the front office thinks so highly of him. Looking Ahead: I’ll be honest, I’m not sure what to expect from the former Pope High School star in 2019. He has shown that if he can stay healthy he deserves a shot with the big league club. However, Underwood has been groomed as a starter and finds himself on a big league 40-man roster that has an abundant number of starters. He’s going to stay in the organization and on the 40-man, I see no situation in which the front office gives up on him, yet. But perhaps it has come time to groom Underwood for a different role with the big league club. His pitch repertoire plays well in the bullpen, and that may be where he finds a way onto the Chicago National League club for longer than one game. In Iowa last year Underwood saw some time out of the pen, and that may be a sign that the front office is thinking along the same lines. The best case scenario is that Underwood has a great spring training and the Cubs stick him in a bullpen that needs more depth. The worst case scenario is he remains in Iowa all year and continues to improve. Either scenario is a win for the Cubs as an organization. Underwood will be wearing the big league blue and white again, it’s just a matter of when. Lifelong Cubs fan, but I love baseball in general and can be found watching various leagues year round. Outside of baseball I'm a Paramedic, family man, film buff, and the guy who will count a giant clump as one nacho.